We’d love your help. 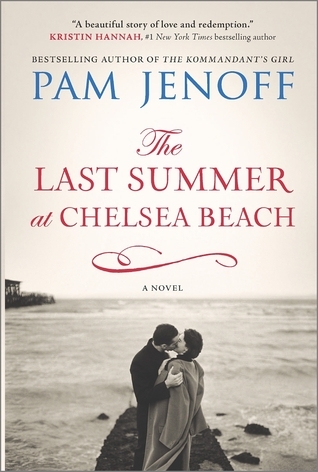 Let us know what’s wrong with this preview of The Last Summer at Chelsea Beach by Pam Jenoff. To ask other readers questions about The Last Summer at Chelsea Beach, please sign up. I found Addie frustrating. Her avoidance of issues by constantly running away was annoying despite her forced and abrupt departure to a new country alone, not completely understanding her parents insistence she flee Italy. I had empathy for her up to a point, quickly it manifested into annoyance and disappointment. Her strength, intelligence and somewhat independence did not match her poor decision-making in the romance department or her overall character. Part 3 is where Addie fell apart for me I found Addie frustrating. Her avoidance of issues by constantly running away was annoying despite her forced and abrupt departure to a new country alone, not completely understanding her parents insistence she flee Italy. I had empathy for her up to a point, quickly it manifested into annoyance and disappointment. Her strength, intelligence and somewhat independence did not match her poor decision-making in the romance department or her overall character. Part 3 is where Addie fell apart for me, I did not like her at all. The romance twist bothered me terribly. Addie crossed a serious line, a move seemingly based on desperation more than love, emotional rebound in my opinion. Frankly the twist ruined the entire narrative, also it was fairly predictable but I kept hoping I was wrong, ultimately not the case. I loved the setting – the tension and fear permeating London. The chaos and desperation of WWII palpable. Addie, Teddy, Claire and Charlie’s roles added texture and really made WWII come to life, air raids, bombings were felt with the turn of every page. I enjoyed the story, I only wish Addie wasn’t flighty and such a contradiction. No surprise the romance element was a miss for me. I wish Jenoff ended it differently. No doubt this novel will appeal to fans of historical fiction, WWII and war romances. I devoted a significant portion of my day to reading this book - when I really needed to be doing other things - and in the end, I didn't even like it very much. It did hold my attention, but the main character and her frequent running away got to be a bit much, and she sounds so meek and plain and yet these wonderful men are crazy in love with her. (To the author's credit, at one point a character does very bluntly say to her that she can't quite figure out why it is two great guys are falling a I devoted a significant portion of my day to reading this book - when I really needed to be doing other things - and in the end, I didn't even like it very much. I would have liked the book much better if it had ended before part three. I could have handled the book ending with the conclusion of part 2, it was sad, but it made sense to me and made Addie seem like a stronger character. But part 3 is what sort of ruined the rest of the story for me. It just made me angry. What I did enjoy about this book was the London setting during WWII and the characters' involvement in the war. That's what kept me reading. The writing really brought this era to life. Overall the story is okay. Other people may not feel the same sort of disappointment I felt at the way the story ended. I have a bit of a soft spot for Pam Jenoff's novels. They are just my cup of tea; romance and drama during wartime. This latest read succeeded in living up to my expectations having read The Kommandants Girl series some time ago. When young Italian Addie is sent suddenly across the atlantic to live with relatives in the US once war breaks out, she befriends the lively Connelly family and in particular, their eldest handsome son Charlie. The story is very much a coming-of-age one, set against the I have a bit of a soft spot for Pam Jenoff's novels. They are just my cup of tea; romance and drama during wartime. This latest read succeeded in living up to my expectations having read The Kommandants Girl series some time ago. When young Italian Addie is sent suddenly across the atlantic to live with relatives in the US once war breaks out, she befriends the lively Connelly family and in particular, their eldest handsome son Charlie. The story is very much a coming-of-age one, set against the backdrop of a world at war. The author was careful, as ever, to respect the era in which the story was told. She delivers a compassionate story and vividly describes each of the cities and countries Addie visits. There are a few supporting characters who I felt deserved more reconciliation towards the end of the story; chiefly the charming Teddy and Addie's new found friend, Claire. However, the gripping storyline of the main characters is enough to keep the reader interested until the very last page. I really want to find the positive in this book, which I expected to like much more than I actually did. The bare bones of the plot seemed promising: A young girl escaping wartime Europe on her own ends up being taken in by the rowdy boys of the family next door. Addie loves all of the Connally boys, but falls in love with Charlie. War gets in the way, as does a family tragedy, and Addie ends up running away again and again, always looking for meaning and a place of her own. The problem I had with I really want to find the positive in this book, which I expected to like much more than I actually did. The problem I had with this book is that none of the relationships felt convincing. In particular, Addie has at different points in the book three different love interests, but they all seem rather circumstantial. I never really got the emotional intensity that should have been there, and Addie's decision-making appears illogical at times. As I turned the final pages, I still didn't understand why Addie had made some of the choices she'd made, and certainly never connected with her feelings. Perhaps there was too much telling and not enough showing: We're told about Addie's thoughts and motivations, but it all seemed very surface-level. Adelia was grateful for her aunt and uncle's love, but she felt out of place with them and with her accent. When she met the Connallys, things changed. There were children her own age, children to play with, a family she felt very comfortable with, and their son she fell in love with. Find the full review at http://aliteraryvacation.blogspot.com. I read Pam Jenoff's novel The Winter Guest last year and it was one of my favorite books of 2014. It was the kind of book that had me adding her backlog to my wish list, it was that good. She has a way of presenting complex, unusual stories set during WWII that somehow give you a new angle on a much discussed topic while also making what the characters go through seem relatable and entirely absorbing. I just couldn't put the novel dow Find the full review at http://aliteraryvacation.blogspot.com. I read Pam Jenoff's novel The Winter Guest last year and it was one of my favorite books of 2014. It was the kind of book that had me adding her backlog to my wish list, it was that good. She has a way of presenting complex, unusual stories set during WWII that somehow give you a new angle on a much discussed topic while also making what the characters go through seem relatable and entirely absorbing. I just couldn't put the novel down and I am happy to say The Last Summer at Chelsea Beach was just as captivating. What I appreciate most about the characters in this novel is how imperfect and therefore realistic they all are. These are fully formed beings that are trying to live and love, the best they can, in a time in history that made life anything but predictable. Addie and the Connally boys, especially Charlie and Liam, make many mistakes across the novel, running away from pain and grief, changing their minds about what they should do and where they should go as well as who they should love, and for me this makes them endearing even as I want to shake them around sometimes until they stop making their lives so complicated. People are not perfect so I love novels that don't try to make the characters appear that way. For as much as occurs within the novel, it really doesn't eclipse that much time, just three short years. During that time we see our Addie go from feeling like an outsider in America to feeling like a part of a family with the Connally's, and then we see her go full circle with those feelings once again. We see a few love triangles, some poor decisions and one tragic accident that will break any reader's heart. While the war is always in the background and some of our characters do experience it head-on, The Last Summer at Chelsea Beach really isn't about the war as much as, say, The Winter Guest was, and for me this made it a very different read. At times I felt like I just had to hold on and weather the myriad of emotions these characters go through - love, joy, loneliness, acceptance, anger, jealousy, blinding sadness, duty, acceptance - in order to reach the conclusion they all had to get to eventually: the past cannot be changed and should not be ignored, but should be accepted for what it is so you can move on to the future you are meant, and want, to have. Without the hardships and heartaches they each went through they wouldn't have become the people they needed to be. Clearly from my review you can see this was a character-driven novel for me, which isn't to say that the plot wasn't solid. I was completely immersed in the settings as they shifted from America to war-torn Europe and Ms. Jenoff did a great job, as I expected, of creating this well drawn world in which her story could unfold. There were a few parts that I didn't know quite why they were included, such as a portion dealing with Addie's need to rescue some orphaned children from France, but even those parts were enjoyable and didn't pull away from the central story being told. I've said it before and I'll say it again now, Pam Jenoff's novels are top shelf historical fiction. If you love novels that incorporate history, especially WWII, and want something unlike the usual novel set during this time pick up her novels. The Last Summer at Chelsea Beach was a little heavier on the romance than I was expecting, but even those that aren't big on romantic themes will find much to love here. I'm a firm follower of Ms. Jenoff's and I look forward to reading much more from her. I loved it. Adelia "Addie" has come to America to live with her Aunt and Uncle. Her parents are still in Italy, but they send her over to protect her. Addie is taken to her Aunt and Uncle's beach house where she meets the Connally family. Four Irish Catholic boys. Over the years she becomes like a daughter/sister to the Connally family even with people looking at them because they are different. It makes no difference. Then Pearl Harbor. The eldest Connally boy, Charlie wants nothing more than t I loved it. Adelia "Addie" has come to America to live with her Aunt and Uncle. Her parents are still in Italy, but they send her over to protect her. Addie is taken to her Aunt and Uncle's beach house where she meets the Connally family. Four Irish Catholic boys. Over the years she becomes like a daughter/sister to the Connally family even with people looking at them because they are different. It makes no difference. Then Pearl Harbor. The eldest Connally boy, Charlie wants nothing more than to fight. Promises are made. The family is afraid of what war would mean especially with all the boys, but it is an unexpected accident that throws the future of the entire family into a tail spin. Addie runs. She runs to Washington and later to London not wanting to deal with her own grief. Addie wasn't a character I really took too right off. She seemed always a bit of a misfit. As she slowly evolved into part of the Connally family, the more I took to her. When the unexpected accident occurs (sorry not going to ruin the book by telling you!) My heart breaks for Addie. Once again she is left alone--the little girl sent off on a boat without her parents. Addie doesn't sit around feeling sorry for herself, but takes off to Washington. When her past shows up, she takes off in order to protect her heart. She runs of to London and a possible new future. Ok I would LOVE to start giving some major story details, but I will refrain. Adelia Monteforte boarded a ship, alone, during the summer of 1941 in Italy. Her parents sent her to America to escape the political situation in Italy. She made the entire voyage on her own and met up with her aunt and uncle whom she has never met. Adelia now lives in Philadelphia, but for the summer she is spending it at her aunt and uncle's beach house in Atlantic City. There she meets four Irish-Catholic brothers, the Connallys. They become her first real American friends; she even hits it o Adelia Monteforte boarded a ship, alone, during the summer of 1941 in Italy. Her parents sent her to America to escape the political situation in Italy. She made the entire voyage on her own and met up with her aunt and uncle whom she has never met. Adelia now lives in Philadelphia, but for the summer she is spending it at her aunt and uncle's beach house in Atlantic City. There she meets four Irish-Catholic brothers, the Connallys. They become her first real American friends; she even hits it off with Mrs. Connally forming a special bond with her. During the summer, the boys help Adelia break out of her shell and even smile again. Once summer is over and they return to Philadelphia, but things change as war is looming. Adelia's secret crush on Charlie Connally becomes even more real than she ever thought imaginable, but then tragedy strikes. Adelia flees to Washington D.C. to try her luck at a newspaper and then finds herself in London, which is even closer to the war than before. Pam Jenoff's epic historical romance swept me away. The Last Summer at Chelsea Beach is one of my favorite books of the year. War stories are sometimes hard for me to read, but this one blew me away, and in a good way! Pam Jenoff's prose is gorgeous, and her characters are so real. I highly recommend this one. Good story, thank you Jenny B for letting your Sis borrow your book! I received an ARC of THE LAST SUMMER AT CHELSEA BEACH and quickly devoured it. Pam Jenoff has an incredible ability to bring together lush love stories within the desolation and devastation of war. Her characters are rich and authentic, and the setting and history so lifelike I felt I was living in the midst of World War II through the pages of the book. Can't wait to go back and read more of Pam's work (and see what she comes up with next)! I absolutely loved THE LAST SUMMER AT CHELSEA BEACH. It's the story of Adelia Montforte, who is forced by her mother to flee fascist Italy for America. Once there, she lives with her aunt and uncle, and meets the Connally family, who will have a lasting impact on her life. Set against the backdrop of WWII, THE LAST SUMMER AT CHELSEA BEACH is a story of bravery and romance, family and friendship. If you like historical fiction or romance, you will absolutely love this book. This book is set in the U.S. and England during WWII, which is always an interesting to period to read. Beginning in the U.S., we meet our series of characters, mainly centered around Adelia Monteforte, who is an immigrant from Italy living here in the U.S. with her aunt and uncle. She quickly becomes friends with a family of boys who live nearby and spend their summers at the beach, as do her aunt and uncle. Although the book spans two continents and several countries, the main conflict is betwe This book is set in the U.S. and England during WWII, which is always an interesting to period to read. Beginning in the U.S., we meet our series of characters, mainly centered around Adelia Monteforte, who is an immigrant from Italy living here in the U.S. with her aunt and uncle. She quickly becomes friends with a family of boys who live nearby and spend their summers at the beach, as do her aunt and uncle. Although the book spans two continents and several countries, the main conflict is between Adelia and the brothers from this neighborhood. Their lives all go in very diverse (but somewhat predictable) directions as the U.S. enters WWII and needs more young people to fuel our fight against global fascism. This is a wonderful love story taking place during the Second World War. Readers know that, every once in a great while, stories appear which are retained forever because of their capacity to overwhelm and delve into a person’s heart so deeply, that the tale becomes a part of them. Upon saying this, it will come as no surprise to learn that behind the power, suspense, romance and history found in this one amazing creation, is author Pam Jenoff. When we begin, Adelia Monteforte is put on a ship bound for America by her parents. The tide is turning and the end is near Readers know that, every once in a great while, stories appear which are retained forever because of their capacity to overwhelm and delve into a person’s heart so deeply, that the tale becomes a part of them. Upon saying this, it will come as no surprise to learn that behind the power, suspense, romance and history found in this one amazing creation, is author Pam Jenoff. When we begin, Adelia Monteforte is put on a ship bound for America by her parents. The tide is turning and the end is near for their family in fascist Italy, and her parents want nothing more than for Adelia to be safe and have a shot at a life. This brave young girl arrives on America’s shores and ends up living with her aunt and uncle. Although they are a nice couple, they seem to be more than awkward when it comes to raising their niece. What they do for her, however, is head every summer to a place called Chelsea Beach. And here is where Adelia runs into her destiny. An incredible Irish-Catholic family, consisting of four boys who each have their own attitudes and emotions, envelop Adelia and bring her ‘in’ as part of their family. They all grow up, experiencing emotions from anger to envy to love; yet, even as they are having fun, the fear of WWII going on across the ocean hangs over them like a veil of darkness. Adelia falls in love with the eldest boy, Charlie, but their hopes for a lovely life are dashed when Japan bombs Pearl Harbor and America enters the frightening battle. Pain occurs on Chelsea Beach which sends Adelia running straight into, and not away from, the war. Her job on a newspaper, helping children in an orphanage, dealing with the youthful emotions that have strengthened over time – all of these cause Adelia to find herself stuck in tragedies. The Germans seem almost easier to deal with, considering the fact that every time Adelia turns around, the past comes back to haunt her. “The Kommandant’s Girl” was the first amazing novel by this author that dove into readers’ hearts and stayed there. With this new story, readers will once again be in awe of the power and beauty of these characters that will never let them go. I have to say, Pam Jenoff has yet to make one mistake when it comes to delivering the best of the best in literature. The story begins with sixteen-year-old Italian Jewish immigrant Adelia (“Addie”) Montforte arriving in America in 1941, having been sent by her parents to take refuge from the Germans with her aunt and uncle in Philadelphia. Addie is despondent, but perks up when the three of them go to the New Jersey seaside for the summer and she meets the Connally family next door. Irish-Catholic and full of life and fun, the parents and their four boys take Addie into their lives immediately. She loves them a The story begins with sixteen-year-old Italian Jewish immigrant Adelia (“Addie”) Montforte arriving in America in 1941, having been sent by her parents to take refuge from the Germans with her aunt and uncle in Philadelphia. Addie is despondent, but perks up when the three of them go to the New Jersey seaside for the summer and she meets the Connally family next door. Irish-Catholic and full of life and fun, the parents and their four boys take Addie into their lives immediately. She loves them all, but in particular is attracted to Charlie, the oldest of the boys; he is her first crush. But when America enters WWII, Charlie is gung-ho to sign up and go abroad. Before he takes off, however, tragedy strikes the Connally family, and they pack up and leave for parts unknown without a word to Addie. Addie herself flees - first to Washington, and then, after an unexpected encounter with her past, overseas to work in the London office of "The Washington Post." There, she steps into roles unusual for women, but suited to the woman of talent and moxie she has become. But she can’t forget Charlie, nor the calamity that tore them all apart. In the end though, there is a realization by the characters that the old world didn’t exist anymore, with all of the bittersweet implications that epiphany produced. Still, there is an opportunity for redemption, and hope for a better future. Discussion: Jenoff is a good writer who pulls you in right from the beginning, adding historical elements that impart interest and significance to the story. I didn’t like Addie a lot, however; I thought many of her actions were selfish, especially regarding her behavior toward her aunt and uncle. Even in the end, when she was supposed to be “wiser” about what mattered, she sort of blew off her aunt, who was in a time of great need. Nevertheless, it’s a good story, and one I continued to think about after I had read it. 16-year-old refugee Addie escapes Fascist Italy to live in Atlantic City with her aunt and uncle. But her journey is not over yet..
It’s only right that this story is from the mouth of Addie, a small Italian Jewish girl. For this is her story. Her story of being a war refugee, an Italian stranger in an American city. A female war correspondent and someone with secrets from the past. As she moves from Italy to the USA, her hopes and fears are poignantly portrayed and this is an emotional story on 16-year-old refugee Addie escapes Fascist Italy to live in Atlantic City with her aunt and uncle. But her journey is not over yet..
It’s only right that this story is from the mouth of Addie, a small Italian Jewish girl. For this is her story. Her story of being a war refugee, an Italian stranger in an American city. A female war correspondent and someone with secrets from the past. As she moves from Italy to the USA, her hopes and fears are poignantly portrayed and this is an emotional story on many levels. I’ve loved Pam Jenoff’s books for some time but this one was a nice surprise as it was totally not the book I expected. The theme of war and of being Jewish during the war really gave me an insight into what it must have been like for a young child and as she tried to fit in with her life in america, I felt both admiration and sadness for her fate. Her story was quite a complex one but the way Pam writes, it’s never hard to follow and the emotional angle continues all the way through. Having Addie as the narrator was a great idea as who can tell her story better than her? I felt as if I was with her, reading her mind, thoughts and emotions and really wanted her to end up with one man (no spoilers) but was shocked by the end! Addie must be the example of so many children taken from their families and sent to safety and the scenes on the harbour were particularly poignant to me. I cannot tell you how much I wanted to like this book. Everything about it sounded like something I would enjoy - lost love, WWII and a story influenced by Little Women. At almost halfway through, I didn’t care about a single character. I couldn't wrap my head around any of Adelia’s decisions - falling for Charlie so easily, abandoning her aunt and uncle with no warning, and fleeing to London. Adelia and Charlie’s connection was lackluster and nothing more than insta-love, which I despise. I didn't like the development of the story or that the WWII aspect felt like an afterthought. Simply put - this just wasn’t for me. This was a gorgeous romantic story of first loves, lost love, and second chances set in one of my favorite time periods, WWII. The prose was beautifully written. The characters were well-developed, complex, and lovable. Every ingredient was there to make this a stunning literary masterpiece, and it was. I highly recommend this book to fans of historical fiction and women's fiction. Check out my Q&A with Pam Jenoff and enter to win The Last Summer at Chelsea Beach with a limited edition beach bag @ Let Them Read Books! This pulled at my heart on so many different levels. Thank Pam Jenoff for once again writing a wonderful book. I found the story a little hard to get through. I wanted Addi to find love and happiness. I loved the ending. Pam is the author of several novels, including her most recent The Lost Girls of Paris and The Orphan's Tale, both instant New York Times bestsellers. Pam was born in Maryland and raised outside Philadelphia. She attended George Washington University in Washington, D.C., and Cambridge University in England. Upon receiving her master’s in history from Cambridge, she accepted an appointment as Speci Pam is the author of several novels, including her most recent The Lost Girls of Paris and The Orphan's Tale, both instant New York Times bestsellers. Pam was born in Maryland and raised outside Philadelphia. She attended George Washington University in Washington, D.C., and Cambridge University in England. Upon receiving her master’s in history from Cambridge, she accepted an appointment as Special Assistant to the Secretary of the Army. The position provided a unique opportunity to witness and participate in operations at the most senior levels of government, including helping the families of the Pan Am Flight 103 victims secure their memorial at Arlington National Cemetery, observing recovery efforts at the site of the Oklahoma City bombing and attending ceremonies to commemorate the fiftieth anniversary of World War II at sites such as Bastogne and Corregidor. Having left the Foreign Service in 1998 to attend law school at the University of Pennsylvania, Jenoff practiced law at a large firm and in-house for several years. She now teaches law school at Rutgers.